0.0 4:05 Leave from home and today LP (my husband) and I are driving to Blythe, California. I’m glad we are driving in the opposite direction, because both lanes are full, stopped and just crawling along. Part of the road was being torn up but there is also an accident and the traffic was being redirected off interstate onto the service road, I think near Eloy. 49.9 4:56 The start of I-8 after leaving I-10. 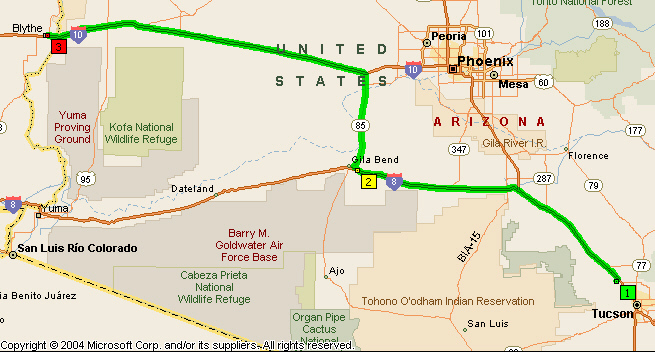 We will be leaving the interstate at Gila Bend at Exit-119 to take AZ-85 north to I-10. It was sunny when we left home, but now it is quite cloudy and I can’t say that I’m sorry. Otherwise I would be driving into the sun by now and have it shining in my eyes, so the clouds are a bit of a blessing. 110.7 Entering Gila Bend, founded 1872, El. 735 feet ...gas is $2.69 ... 36 miles to the junction with I-10. This is a good route to avoid Phoenix. Leaving the interstate Business 8 loops around to the junction with AZ-85. I have two big trucks in front of me at a stop sign, so we have to wait till the road is clear. 122.2 Road work, but to the left lots of huge sheds, makes me think there’s a dairy farm there, a really big operation. 141.4 About half way across a long bridge, which crosses the Gila river and some low surrounding countryside ... there was some water in it, but I don’t know if it was just a pool or actually a stream. 142.0 A field of lucern or I should say fields - fairly extensive, both sides of the road. 144.0 344 miles to Los Angeles and there’s a ripe field of corn to my right. 149.0 6:24 On I-10 ... 2 miles to Exit-109 so there is still 111 miles to go to the California border. Driving under 3 power lines. At the last exit there was a sign for the Palo Verde Nuclear Power Station. Exit 98 is also Verde nuclear generating station. 165.4 A lot more hay being grown both sides of the highway. This is just before the exit for Tonopah. 174.9 Leaving the highway at a rest area. 178.0 The hill on the right, is a mountain that comes right down to the road and has lots of the black lava rock all over it. 217.0 Exit-45 for Vicksburg Road and another big dairy farm to the north of the road. 234.6 Now passing or driving through Quartzsite. 263.7 The California state line and we have to stop just ahead for an inspection station. 264.3 Entering Pacific time, but since Arizona doesn’t have daylight saving time we are already on Pacific time. We will be leaving the interstate at Exit-239, Lovekin Blvd. 268.4 8:10 Arrive Best Western Sahara Inn, Blythe. 268.5 8:20 Room 141 - Parked for the night. 268.5 9:38 Leaving Best Western Sahara Inn ... I was not in a good mood because I had woken at 5:30 am and it was over 4 hours later that we were getting on the road!!! 269.2 9:40 On the interstate. I’ll leave the interstate again because I forgot to get gas in Blythe. 273.8 Citrus groves on the left after we’ve re-entered the interstate. 281.0 There are mountains, mountains ranges to be seen both north and south of the road but on the whole the landscape is pretty desolate looking and the mountains are bare rocky rugged slopes. About the only thing growing is creosote and maybe the Palo Verde or iron wood. 309.0 North of the road a fairly large young orchard has been planted out here in this desolate land, and must be getting some water from somewhere. The trees are about 2 foot 6, 3 feet high. Ahead of me to the right, there looks to be a large pipeline coming out of the mountain range. Exit-192 if for CA-177 to Desert Center. 317.0 Passing Exit-192. Along the way in this area, there are quite a number of palm trees, but they’re very sad looking. Some of them hove no tops and their trunks are all bent over or fallen over completely ... very sad looking. 318.7 El. 1,000 feet. Just before that there had been a sign for Chiriaco Summit which was 15 miles, so over the next 15 miles I guess we are going to be going up for a bit (Note: Chiriaco Summit is a small unincorporated town and travel stop located along Interstate 10 in the Colorado Desert of Southern California). 324.2 I just noticed an ocotillo ... that’s a long way from home. I am looking around to see if I can see any others in the area. 325.5 There’s a large pipeline, another one coming out of the mountains, slightly ahead to my right. Speaking of ocotillo, I think we saw quite a number at the time my husband and I had gone south along the Salton Sea, then west on CA-78 through Julian, to go to San Diego. Julian was one of the places I know was badly burned in the fires 2 or 3 years ago. 330.0 Passing the pipe line coming out of the hill ... there are actually 3 sets of pipes all together, and they just come out of the mountainside and down the hill. I think Chiriaco ... there are services here. 337.0 Passing Exit-173 ... according to GPS the elevation is 1,601 feet. 341.2 Exit-168. Leaving I-10 to go through Joshua Tree National Park to Twentynine Palms. 47 miles to Twentynine Palms. 342.5 10:51 Leaving after stopping at the entrance to Joshua Tree National Park. 343.0 Seeing a number of ocotillo. The road is winding through rugged rocky hills. A little vegetation but not very much, and also crossing over wide sandy watercourses which of course are dry. I don’t know if some of the plants in the valley are young Joshua trees or whether they’re yuccas. 348.5 11:02 - 11:36 Cottonwood Visitor Center, Joshua Tree National Park. 351.4 Passing a few of the huge boulders which you see in other parts of the park, we’ve also started to see a few small Joshua trees. 355.0 El. 2,467 feet. We just can over a crest and ahead you can see mountain ranges and a valley, quite some distance away. 358.9 The road is descending into the broad valley now. We have been passing though very rugged terrain, rocks everywhere. 362.5 Turkey Flats. I think this is the name of the valley I’m looking at and looking over it is Pinto Mountain ... also Turkey Flats is part of the Pinto Basin. 363.5 Stopped at an exhibit area. 364.5 12:08 Leaving after taking pictures of a type of milk weed which had both a caterpillar and a bugs on it. 366.8 Quite a large number of ocotillo in the basin and a few of them still have an odd flower on them, Some of the ocotillo here have very thick sturdy stems, maybe 2" in diameter, some of the biggest I’ve ever seen. 368.5 Driving across a field of cholla, teddy bear cholla and they’re really quite thick . I was thinking I spoke about those big round boulders way back and since then there hasn’t been anymore, though I know we will see them further ahead. 368.9 12:18 - 12:33 Cholla Garden. 374.5 Plants on the side of the road with big white bell type flowers, the same as the one I started growing underneath silver maple in the backyard in Lincoln. A number of bushes as I drive along the road. 375.7 A field of the big granite boulders. Since coming to the round boulder fields, there are more Joshua trees and some of them are bigger now, not big ones but bigger. 375.9 12:46 - 12:52 “We Have Contact” (round boulders). 378.3 12:59 Leaving, and as the road goes ahead, still through the range, there is a gap looking onto another valley. 379.2 A stop sign and we turn to the left instead of going to the right to Twentynine Palms Visitors Center. 381.8 1:08 - 1:09 Stopped .. a sign “The intruder”. 382.1 1:10 - 1:16 Stopped again this time for skull rock. 382.9 1:19 - 1:25 Stopped near the entrance to a camping ground. The area is called Jumbo rocks. I stopped because I want to take a picture of unusual tops of some of the rocks where softer stone was eroding away. I’m not sure whether the birds on top of the rock are ravens or crows. I tend to think they’re ravens but I could be wrong ... there are a number of them. 388.7 As well as rocks there’s lots of Joshua trees, fairly big ones, fairly healthy looking, also some young that are coming along. Some of the areas had a lot of dead ones and not much in the way of young ones. 390.0 Turned off for Keys View, but I’m not going to be going out there. 390.2 1:41 - 2:23 I’ll look at the map before we head on and have a bite of lunch here. We had lunch in the shade Joshua tree just below Cat Rock and it was a very pleasant spot. There is a large black bird flying around ... some people think they’re crows. I thought they were ravens but maybe they are crows, I don’t know. Don’t know what distinguish the two. We are not going out to Keys View for the view over Coachella Valley ... we just turned in here to go to the picnic area below Cat Rock and now we’re heading back out onto the road through the park and heading for a township actually outside of the park which is called Joshua Tree. 399.0 The road is passing through rocky hills now and it’s started to descend, probably down to the next valley, we can’t see it a present we are in hills wondering around, the hills are very rocky not like the big rocks, this is a lot smaller. 400.0 Around a corner and ahead you can see the broad valley now, we’re still in the hills and winding down. 401.3 Leaving Joshua Tree National Park. Immediately after leaving the park, there are a lot of homes built on the hillsides. Whether this is the township of Joshua Tree or not, I don’t know, it doesn’t have any signs for it. 405.5 We still haven‘t got down to the valley yet. The road is winding around. 405.7 Road straight ahead now going on the last descent before getting to the valley. 406.5 2:49 Stopped right at the junction with CA-62, We take this to the left or west for a short distance before turning north again. 412.5 Turned off on CA-247. 413.2 3:06 Going back on the highway after having pulled off to make sure we’re going the right way and putting in the address of the motel. 414.0 There’s houses built in the hills among all the rocks up here at all different levels. 422.4 Joshua trees around but they’ve more or less petered out now. They were quite thick before even among all houses along the highway. 452.0 A young orchard to my left and just ahead there are irrigation sprinklers working on lucern, I think. In the background there are mountainsides all scared from mining. 458.3 3:50 Turned with CA-247 north to Barstow, this was in Lucerne Valley. 459.3 3:52 Turning off on Rabbit Springs road. We still have to go 157 miles and 2½ hours. 460.8 Sign: Trucks Use Lower Gear. 462.2 Crest of a hill - 2,953 feet, and the valley is ahead from that point. 463.2 3:58 Turned on the CA-18 and immediately crossing dry lake, so to speak, all sandy and nothing growing on it, both sides of the road. 469.8 The road is going to turn shortly but straight ahead at the moment is another heap of big rocks. We’re seeing this at lots of different places, this one just happens straight in front of the road. These are more like big rocks rather then the smaller rock that are scattered on the hill sides. 472.6 On the outskirts of Apple Valley. 474.8 Driving through Apple Valley. 478.1 I think we’re still in Apple Valley but I’m not sure, I haven’t seen any change of names. Lots of businesses. 481.2 Traffic lights at Apple Valley road, so we’re still going through Apple Valley and still lined with businesses both sides of the road. 481.4 Leaving now and winding up into the hills. 481.8 Victorville Welcome You. So from Apple Valley the road just went up a hill into a very rocky area, as if it was going back into the country, went over summit or crest, and there’s Victorville ahead. 482.1 Crossing the Mojave river. 482.5 We’re still on CA-18 but at this traffic light we’re meeting the business loop for I-15. It is also part of historic route 66. 485.2 Turning off CA-15 at Air Expressway (Air Base Rd.). 490.6 4:33 The junction with US-395 in Adelanto. I’m not sure how I’m going to map out the roads we took because the last little section was pretty confusing! 493.4 Seeing a number of Joshua trees. We’re coming to Kramer Junction which is where we turn onto US-58 and I’m going to find a phone first, so I can give Anne a call. 521.5 5:04 - 5:14 Stopped at the gas station looking for a phone. Leaving from Kramer Junction. 546.3 City Limit of California City, pop. 13,000. I’m not sure where they are, all I can see is creosote and mountains in the distance. 555.5 Just passed the first exit for Mojave and it looks as if there might be a bit of a airplane bone yard here - a lot of big planes that look like they’re all in storage. Exit-167 is for the junction with CA-14 which comes down from US-395 and this, I think, is the second exit for Mojave. The range of mountains is in front of us now as we loop around the town and there’s a lot of windmills on the crest of the hills. 560.1 5:49 Passing Exit-167 for CA-14 to Bishop and to Mojave. The windmills are too numerous to count. 563.0 The elevation is 3,065 feet and this is just after the last Mojave exit and as we go towards the mountain range Tehachapi. 565.7 The hill with most of the windmills on is directly in front of me now. 568.1 Now there’s another hill with even more windmills on it, in front of me and ahead. 571.6 Passing a hill that is absolutely covered with windmills, they’re all different heights so that they can catch the wind more efficiently, I guess. 573.2 Some green grass to my right and a fairly large heard of cattle grazing ... there have been lots of cattle along way. 577.4 Tehachapi Summit, 4,064 feet. The GPS is showing 3,960 feet (that was after I recorded everything). 581.1 Downhill the next 14 miles. 5% grade for 3 miles. 585.0 Some small Yuccas along the embankment are flowering. 5½% grade ½ mile long, they’re instructing you at different sections of this downhill run. 587.1 El. 3,000 feet. Sign for National Chavez Center. A second-generation American, Cesar Chavez was born on March 31, 1927 near Yuma, Ariz. He and his family became migrant farm workers after they lost their farm in the Great Depression; Chavez was 10 the time. By the time Chavez left school after the eighth grade, he had attended more than 30 elementary and middle schools. His life as an activist began in 1952 when he joined the Community Service Organization, a prominent Latino civil rights group. Chavez coordinated voter registration drives and conducted campaigns against racial discrimination in urban areas. Chavez led the UFW from 1962 to 1993 and his leadership resulted in the first industry-wide labor contracts in the history of American agriculture. Chavez’s union’s efforts also led to the passage of the 1975 California Agricultural Labor Relations Act. A strong believer in non-violent principles, Chavez employed peaceful tactics such as fasts, boycotts, strikes and pilgrimages to achieve his goals. In 1988, at the age of 61, he fasted for 36 days to highlight the harmful impact of pesticides on farm workers and their children. Cesar Chavez passed away on April 23, 1993 in Arizona. More than 50,000 people attended his funeral services held in Delano. His motto in life “si se puede” (“it can be done”) embodies the legacy he left to the world, inspiring millions to seek social justice and civil rights for the poor and disenfranchised members of society. In 1994, he was awarded the Presidential Medal of Freedom, the highest civilian honor in America. 6% grade for 3 miles. There was a sign - 6% for 2 miles - 45 mph advised. 594.2 End of freeway in ½ mile. 596.0 The hills are bare except for being covered in grass, all dried and brown. 597.6 Crest, 1,837 feet and beyond the hills you can see the flat country in the distance, not quite out of the hills yet, but ahead is a broad expanse of country. 601.5 A valley to my left, and the flat country is very green - not sure what all is growing there, but lots of crops or vineyards or citrus groves, just very green. 605.7 Signs for dried fruit, nuts and more ... passed one place, and now more signs, orchards both sides of the road. 606.9 Vineyard on the right. 609.9 Working oil pumps among the vineyards and the orchards ... they are scattered right across the country side. 612.5 The road has become 3 lanes wide. 617.2 Three lanes ended and the road is back to two. 620.4 Turning onto Real Road. Actually driving through the neighborhood now going north. 621.4 6:45 Arrive Days Inn Bakersfield ... phoned Anne whilst being checked in and she got to the motel just as we had parked near our room (#278) ... she helped us take our things in before we followed her to the restaurant where we had supper together. 622.3 Back at Days Inn at the end of the day. 622.3 8:38 Leaving from Days Inn Bakersfield for Aptos. 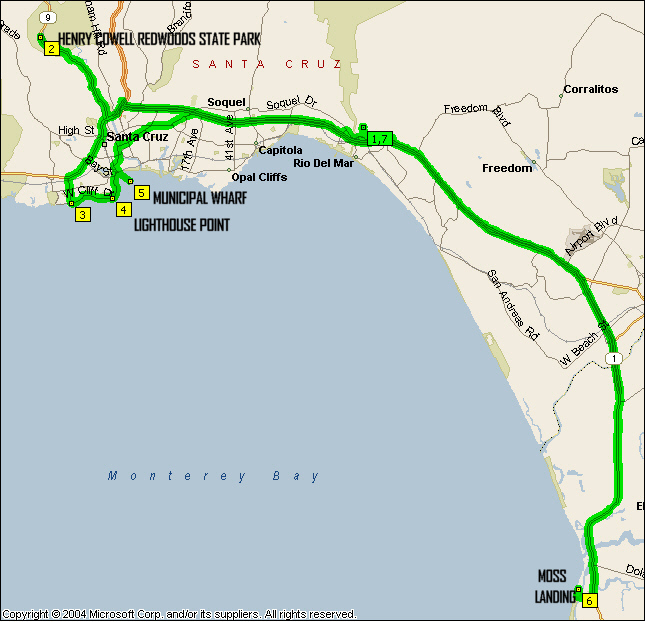 Before leaving the gas station I checked the map and wrote a list of the roads we planned to take en route to Aptos. 631.5 9:10 Corner of CA-58 and Allen just before the turn into Anne’s. I took Anne’s recommendation to go out Stockdale to Allen and that made it a nice easy route avoiding the heavier traffic on CA-99 and now I’m turning onto CA-58. 635.5 I believe the orchards on both sides of the road are almond orchards. 638.7 25 miles to McKittrick. 642.7 A big Frito-lay factory on the left. 647.2 Just gone under I-5 and McKittrick is 17 miles, The hills or the mountains ahead are very hazy, I suspect a lot of pollution in the air. 649.6 Buttonwillow - the heart of cotton country and there was a gin to my left. On the right is a small orchard, or I should say an orchard of small trees, just young ones. 650.8 Buttonwillow, pop. 1,600 - El. 268 feet. 652.0 Big fields of hay that have been cut. 652.7 Plants growing in rows, but I can’t tell from the leaves what it is growing there, obviously some kind of crop. 653.0 Pistachio trees on the right. 653.4 Another kind of crop on the left, maybe they’re cherry tomatoes or something. They almost looks like cherry tomatoes, mostly green but there are a few that are ripening. Somebody has a Mimosa tree in their front yard and it’s flowering. 654.1 Another young orchard on the right and what looks like hay field (alfalfa) on the left. 656.0 Crossing the California aqueduct. Some of the plants, same plants as the big white bell flowers are flowering along the road, somewhat healthier looking then those we saw back in the national park yesterday. 661.0 As we approach the hills we see all the scaring from the oil drilling field and there are working pumps and tanks scattered over the entire area. 662.1 Start of the winding road going into the hills and climbing. 663.0 We go over the crest, then continue on a winding road downhill into McKittrick. 663.7 9:50 The junction with and turning onto CA-33. Last time we would have gone left with CA-58 so we’re going a different way this time. 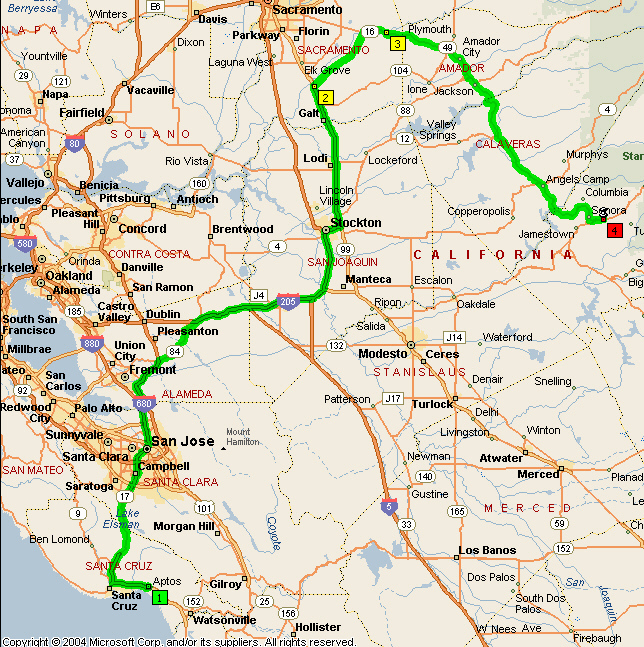 Coalinga is 74 miles, and that is where we switch to another highway. 667.5 Still have all the oil drilling going on to my left, a fairly extensive area. The road is moving away from the hills towards flat country. 668.1 4 oil pumps right near the road all working. There are pipelines cutting across the oil fields and I still have a lot of them out to the left and I noticed just ahead there’s another large area on the right. The field on the right looks like a forest of oil pumps and on the left as well. It reminds a bit of Long Beach California. 672.0 There are pumps right up to the road on both side of the road. Acres of them. 675.3 The pumps are not as thickly congregated together as they were earlier. Still shows what we have been driving through. There have been wild sunflowers blooming along the side of the road. 676.7 And now we have pipelines on the left and cultivated fields to the right. One field almost looks like carrot tops but I don’t know whether that what it is or not. 677.8 Now the start of an orchard. The oil field continues to the left but is further away from the road. It’s at the base of the hills whereas the road is traversing flat country and is dedicated to agriculture in one form or another. 681.7 Oil pumps back by the road on the left. 682.7 10:14 Stopped for road work. 684.9 10:30 End of road work. That’s from where I left from following the pilot car. 689.0 According to the GPS we still have 182 miles to go. I say this because the GPS is wanting us to turn left on CA-46 but we’re going to stay with CA-33. 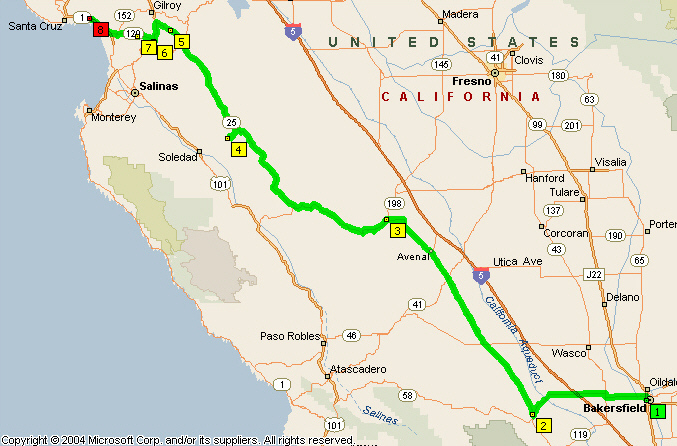 690.1 10:35 Coalinga now 48 miles ... we just crossed over CA-46. 690.8 Pistachio orchard on the left. 691.2 The end of the orchard here but there’s a lot more to it further back from the road so it’s a huge orchard. Lots of silos and elevators both sides of the road also. 692.5 Passing a huge plant on the right. I don’t know what it is but there’s a lot of fruit boxes stacked up. 693.1 Orchard on the left, it’s not pistachios this time - look like almond trees. Sign for Paramount Farms - Paramount Farming Company. 696.0 Noticing these little drums again near the orchards - just passed some and those are the second ones I’ve seen. I’m not sure what they do or what they’re used for but they are things I mentioned when I was traveling along I-5 here in California too and I still haven ‘t found out what they’re for. 697.7 More Pistachio trees and this time both sides of the road. 700.0 The road is built up slightly above the surrounding country just grass lands and sunflower growing wild, sunflowers both side of the road and a few oil pumps back towards the hills on the left. 706.6 There are vast tracks of open country side, grass lands and no trees and then in the distance you can see it is cultivated and there are orchards growing. We just crossed over a wide grassland area and now going past a fairly young orchard, not the youngest I’ve seen. Just a corner of it touches the road. 712.1 10:59 Stop light at CA-41. 714.0 Now it’s 162 on the GPS. 719.0 Entering Avenal, pop. 15,000 On the left is a state prison. 727.6 There is something growing out to my right, crop totally yellow with flowers, at the moment but I’ve got no idea what it is. And then there’s bare fields that have pipes in and ready for planting. A stop sign and turning left. To the right is I-5, and CA-33 goes to the left. 736.0 There is a younger orchard on the left and the pistachio trees on the right are loaded with nuts as they have been all along the way. 738.8 Crossing a creek and entering Coalinga. 739.5 Turning onto CA-198 west in Coalinga. 740.9 Leaving the town of Coalinga, the road is starting to climb and going into the range of hills, grass covered hills and lots of oil pumps dotting the country side. Once in the hills, the road becomes very winding, with 35 mph corners. 745.2 The road has wound around into a canyon ... rocky slopes ... there may be a creek running at the bottom ... we’re only part way up, but certainly right in the hills now, much more interesting than the road was earlier apart from all the oil pumps and orchards ... there’s a reason why there was a sign that trucks shouldn’t come this way! Every time the canyon opens out into a little bit of a wider valley, there seems to be a homestead ... I don’t know if there’s any farming or not but certainly there are people living through this area. All along this road there are lots of those plants with the white, trumpet type flowers. This is a fun road through the canyon. The hills are starting to have a lot of trees on them so now rather than being bare grass fields or very rocky, they’re now forested - some trees anyway, live oak maybe. 759.5 We’re seeing a lot more trees now, deciduous trees, pine trees, junipers. I can pick out the pines and the junipers ... as far as the deciduous, I don’t know what the different one are. 761.3 It appears we’re going into another canyon after a brief more open area That canyon didn’t last for very long, although we’re back and forth through that type of area just before entering Monterey county. 762.8 Coming into Priest Valley, pop. 45. There was something I was going to say at that point about oh, we climbing and we went up to 2,390 feet about. That’s what I was going to say the elevation was because we climbed up, but now we come into Monterey county, the road drops down again and it’s opened up a lot, there are cattle grazing and fields although we are still within the mountain or hill range, There is quite a little ranch in this particular valley here. Break check area 6 miles, that usually means your going to be going down hill. There’s a sign signal ahead and now it’s road work ahead. 765.0 One lane road and the light is red at the moment. 765.2 12:02 Stopped for the red light. The light has turned green and I’m pulling over into the left hand lane. The right hand lane is all torn up. 765.6 End of road work. Little critters, I don’t know grass squirrels, prairie dogs or something right at the side of the road - not really prairie dogs as too small for that. 767.0 Just caught a glimpse of the stream below the road. 767.2 A vulture with its two babies at the side of the road. 767.8 Rock slide area the next 3 miles, hills and curves the next 7 miles - Traveling on CA-198 west. 768.1 Leaving from having stopped to turn the tape over. 770.3 12:16 - 12:20 Stopped at the side of the road with the idea of having lunch ... it was ‘break check spot before a steep downgrade ... we changed our minds and went on, but didn’t have any luck in finding a better place! I stopped at a brake check place at the top of down hill for 4 miles 7 % grade and we were going to have our lunch but thought there might be a better place where there were trees we can pull up under ... we changed our minds and decided to continue. As soon as we came over the crest, we looked down into a large lower area, vast area and took the elevation just below the hill .. it was 2,500'. 771.3 12:22 - 12:28 Walked up onto the rock - there’s a hollow in it where people had dumped garbage. There was another hollow with a couple dead coyotes or wolves - horrible small. 1,214 feet at the bottom of the hill ... this is in the valley, a lovely fertile looking valley between the two ranges of hills, and the road is going to be going up again shortly. 774.9 12:32 This is the junction now with CA-25. Leaving CA-198 I have turned to the right onto CA-25 and the next services is 51 miles. 777.0 12:38 CA-25 is following through a valley, the hills to the left have some trees on them, the hills to the right have hardly any trees mostly grass. There’s no sign of any cattle but it looks like ranch country. 782.4 There’s cattle grazing, I thought it looked like ranch country. 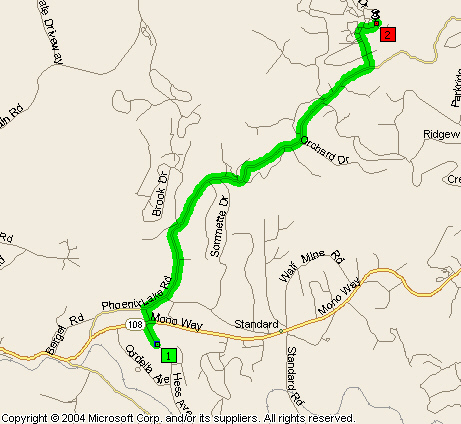 785.0 A road turning off for King City - 15 miles ... King City is on US-101 to the west. 785.4 A field of baled hay, what I call the old fashion bales, the rectangular ones that are of a smaller size and not those great big huge ones they make now. 789.5 A gambol quail ran across the road in front of me. This was a surprise because I didn’t think they be here as I thought they were desert birds. Also there’s lots of little critters running across the road ... they’re not chipmunks, they’re not as big as squirrels but similar kind of body build. 791.5 Lots of hay in a field and these fields for the most part are flat in the bottom of the valley which has broaden out considerably at this particular point. 793.9 Speed of 25 mph for a school. Nice looking little school, maybe a two room school about that and just after the school there’s a lot of Eschscholtzia blooming on the embankment. Actually a lot of houses all through here, ranch places. 794.3 Another turn off for King City. 807.1 Start of a vineyard in the valley. 808.1 End of the vines. 808.9 1:21 Turning into Pinnacles National Monument. 810.9 1:28 - 2:35 Visitor Center, Pinnacles National Monument ... we were able to have our lunch here on the verandah where there was a table and chairs. 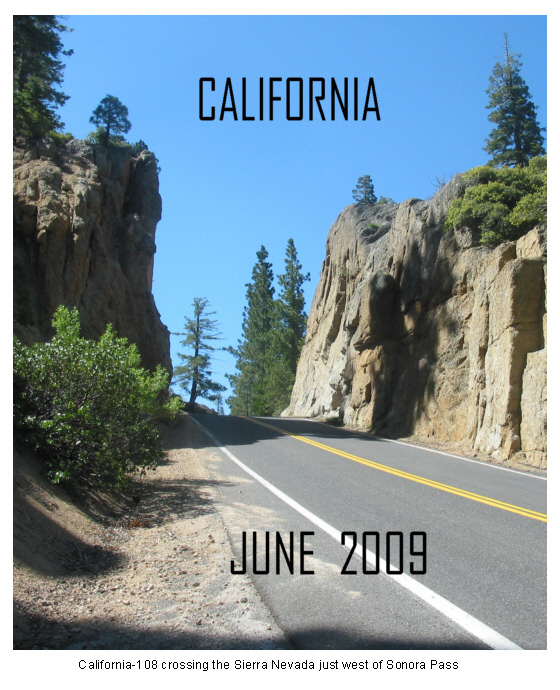 811.6 Entrance fee is $5.00 entering Pinnacles National Monument and the end of the highway, that is CA-146 at the entrance to the park. 814.5 End of the road, more or less inside the volcano ... said to LP it’s a hiker’s paradise, to get up high you have to take the trails. We just turned around. 816.5 2:04 Leaving having stopped for Peak View, and having plotted my route to CA-1 to finish our journey. 817.4 Leaving the National Monument back on CA-146. 820.0 3:12 Back at CA-25 going north, I think it is 35 miles or something like that to Hollister, which I think is where we have to turn. 821.5 Lots of Eschscholtzia or California poppies blooming. Since leaving the national monument the valley has opened up. 832.0 Fairly wide and there’s a lot more houses ... ranching, hay crops being grown I believe and generally a very fertile valley. The hills have a few fruit trees on them, and cattle grazing on the grass right up near the top of the hill that’s to the right. To the left the hills are partially wooded. 833.4 Extensive vineyard to my right and up but not quite to the top of the hill but well up and house that really looks like mansion. 834.5 Vineyard on my right, then one on the left. 836.2 A ditch or a small canal full of water on the left, also sprinklers working in the vineyard. Now there’s vineyard on the right so vineyards seem pretty much all the way through this particular part. 837.3 A dam or a lake on the left and the vineyards still continuing, looks as if there could be a big winery as well. 837.4 The valley has narrowed and there are vineyards going over the top of the hill. 839.5 Back into ranch country, though I can still see vines cresting the hill to my right. 842.0 A golf course on the right hand side. Entering Tres Pinos, pop. 500. 845.4 Golf course on left - some pretty nice homes. Looks as if it was a gated community. 847.6 Stopped for a red light and, I suspect from here on in, a lot more lights and a lot more traffic and bigger towns - just more thickly populated. We got onto US-101 just south of Gilroy off CA-25 we’re on CA-101. 868.0 4:14 Exit-347 - leaving US-101 for CA-129. 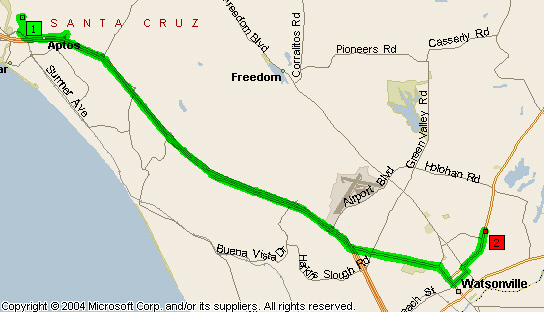 880.6 4:31 Watsonville City Limit, pop.47,000 plus ... Still on CA-129. 887.9 First view of the ocean. 891.2 Left CA-1 at Rio del Mar. 892.8 4:50 Arrive at Josh’s. 892.8 We knew that Josh had a previous engagement for the evening, so when he left we drove down to the beach and sat there for a while. The restaurants there did not appeal to us we drove back near Safeway where we had supper at a Chinese restaurant - Uncle Kwok’s Szechwan Restaurant ($37.84). 906.8 Back at Josh’s for the night. Today Josh took us to Henry Cowell Redwoods State Park where he and I hiked the trail through the redwood forest. We all walked to Roaring Camp railway station to watch the arrival and departure of the steam train. Then he drove us to Santa Cruz to see the pelicans, Lighthouse Park, and out the pier. Josh then drove us to Moss Landing, where I really enjoyed watching all the sea lions on the dock ... so many of them that they were lying on top of one another! Then we went to Phil’s Fish Market for supper, then took the back route home through the strawberry fields. 10:36 Leaving ... we took CA-1 to CA-17 then I-880 to Berkley, where the GPS had us exit and drive a long way along Martin Luther King Road before getting to The Alameda. For the return trip we went west to I-80 which we took all the way into San Francisco, crossing the Oakland Bay bridge. This took us to I-280 which went south to join up with CA-17. 1,095.9 7:11 Arrive back at Josh’s - did not need or want supper when we arrived back. Josh had waited until about 7 o’clock for us before going out to supper with a friend. We spent the day around the house, LP and Josh working on developing our web page. I did some typing, downloaded pictures and played some games. For supper we went to Marie Callender’s (our treat - $38.00). Afterwards we went to Trader Joe’s for brandy. 1,095.9 9:45 Leave from Josh’s. 1,179.9 11:35 - 1:40 Visiting with Amy and Rick at the Academy of Science Museum in Golden Gate Park. We had lunch at the museum ($40.52). 1,183.2 1:50 - 1:59 Photographing the restored windmill in Golden Gate Park, near Pacific Ocean. 1,268.0 4:17 Back at Josh’s. Josh took us to dinner at Severino’s Grill (Tasty Tuesday - 50% off the entire menu), Best Western Seacliff Inn in Aptos. This was another day spent around the house, Josh and LP working on the web site. I mostly played games - it was beaut just relaxing and not having to do anything! Josh drove us to Watsonville for supper at Hong Kong Garden (our treat $55.00). 1,268.0 8:05 Leave Josh’s in Aptos - We will be visiting in Rancho Murieta with old bridge friends from Mississauga, before going onto Sonora. 1,269.0 8:11 - 8:20 Safeway to buy wine - 10% off Mix ‘n Match 6 bottles wines or spirits ($31.27). 1,288.7 Going over Patchen Pass, commonly referred to as "The Summit" - El. 1,800 feet. This is on CA-17 which crosses the Santa Cruz Mountains. 1,302.6 Leaving CA-17 to go onto I-280. 1,308.0 Passing the exit for US-101 which goes up to San Francisco and down to Los Angeles. I-280 becomes I-680. 1,314.7 Jacaranda tree in bloom along some of the roads on the left. 1,330.2 9:23 Exit-21B CA-84 to Livermore. 1,343.4 10:12 On I-580 going east. 1,348.0 Summit, El. 1,009 feet - I didn’t see name of the summit. There is a tremendous number of windmills on top of all the hills here - a few are turning but most of them are pretty still. The highway is 4-lanes going east and 3 of the lanes going up to the summit all had trucks in them, passing each other, 3 lanes of trucks. 1,353.2 I-580 turns south and we go straight ahead and are now on I-205. 1,363.0 Huge depots with hundreds of trucks to the right. The closest to the road is Roadway, also Yellow and there was another beyond that but I couldn’t see the details. Leaving I-205. I just noticed the uprights for a lift bridge to the left. 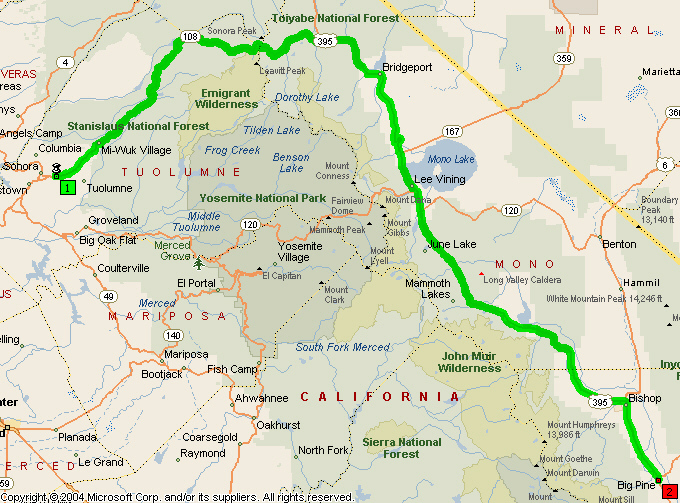 1,368.7 Any how we’re going to get onto CA-120 which goes to Yosemite and Sonora. 1,369.1 10:45 Leaving the highway to go on CA-120, and in doing so we cross a river, the San Joaquin. 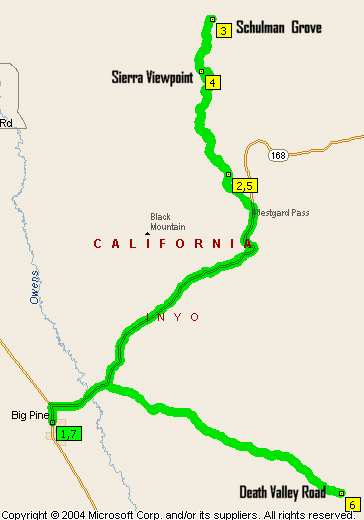 1,375.6 The road splits to go south on CA-99 or north on CA-99. It does a big loop around before actually getting onto the highway - a fish hook! 1,376.5 10:43 The junction with CA-99. 1,377.2 Passing the exit for CA-120 to Sonora. 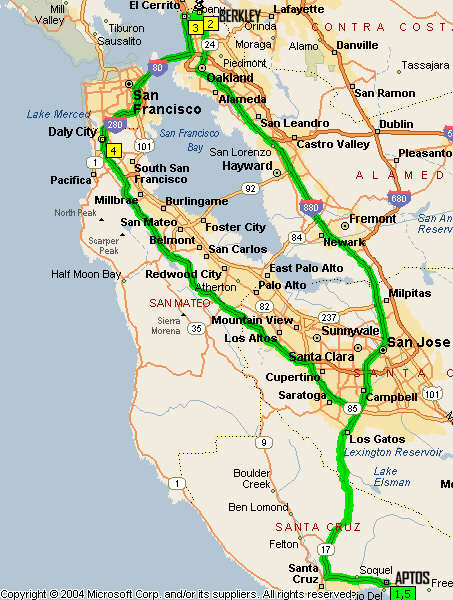 This route, as has many others we’ve been on in the San Francisco area, has big hedges, all in flower at present, some white but mostly pink and reddish color - all oleanders. The median is so filled up with the flowing oleanders, we rarely see the traffic going in the opposite direction. Sometimes there is even oleanders on the right side as well, so that it is like you’re going down a channel or canyon of these bright flowers. 1,394.7 The fence to the right of the road covered thickly in honeysuckle, which is also blooming. Exit- 281 off of CA-99 is for Dillard Road, which is the one we want. 1,417.6 11:20 Left CA-99 for Dillard Road. 1,429.2 A mimosa tree in flower. 1,430.2 An orchard to the right, a fairly big one and I’m not sure but I think they might be walnut trees. 1,432.2 Large walnut orchard on the left now - I’m pretty positive that they are walnuts. 1,432.5 The junction with Jackson Road which I believe is CA-16 and what we want. 1,437.2 11:48 Turning into Rancho Murieta south off the highway. 1,437.6 11:50 - 2:58 Lunch with Dora and Keith in Rancho Murieta. 1,450.7 Turned off CA-6 to CA-49 to Jackson. 1,450.8 3:14 On CA-49 ... Sonora is 55 miles. 1,475.7 3:47 Entering San Andreas - 92° here. 1,494.2 I saw a big dam out to my right and now it’s out to my left - “beautiful New Melones Lake, the fourth largest man-made lake in California. New Melones Lake was formed with the completion of a 625-foot high dam in 1979”. 1,495.0 Start of a high bridge over the dam. 1,495.4 End of the bridge and the road will be going back into the hills again. 1,498.0 Just going through Tuttletown. 1,503.7 4:25 Entering Sonora, pop. 4,423 - El. 1,796 feet. 1,508.2 Visitor Center, where we stopped for some information about motels and got a map. 1,513.0 Arrive Aladdin Motor Inn - Room 120. After unpacking the car we drove out to see LP’s cousin, Diane. 1,517.3 Arrive Diane’s and Jack’s. On our way back to the Aladdin Motor Inn we stopped at the Best Western Sonora Oaks and were fortunate enough to be able to book a room for the next night (the Aladdin was totally booked out! 1,521.7 Back at the motel for the night. 1,521.7 9:19 Leave Aladdin Motor Inn. 1,529.9 Best Western Sonora Oaks to check in and unpack the car. 1,538.2 Best Western Sonora Oaks at the end of the day. 1,538.2 8:13 Leave Best Western Sonora Oaks. We’re at the Best Western in Senora and we’re leaving to head over the Sierra Nevada today. We had decided that we would take CA-108 over the Sierra Range rather than go towards Yosemite and take CA-120, the Tioga Pass Road. We had breakfast at the motel and then went and got gas. After getting gas we’re turning of Hess Avenue into the entrance for CA-108 east. 1,542.6 The elevation is 2,815 feet (GPS). 1,543.8 Elevation marker at the side of the road - 3,000 feet. 1,550.7 By the time we reach Mi-Wuk Village we are well into the forest, tall, tall trees, lots of pines, and I think there’s some cedar, but I don’t know if there are redwoods or sequoias. I can’t tell, other than it is certainly a conifer forest. 1,556.7 The road divided and is currently 4-lanes but is reverting to two-way traffic shortly. 1,558.8 End of the divided road at this point. 1,559.7 Road markers have extra poles added to the top of them - snow plough markers. 1,562.0 Lupines flowering by the roadside - there’s lupines along quite a length of the road. 1,566.5 Passing the South Fork of the Stanislaus River. 1,567.2 Sonora Pass 34 miles, the junction with US-395 49 miles. 1,568.0 Seeing a lot more Lupines again. 1,568.9 Looking ahead over a valley we can see some rugged mountain tops, still with a bit of snow on. Now there are other colored flowers, yellow ones and orange ones but just driving I can’t tell what they are. 1,575.4 6,000 feet. The pine trees I think are the Ponderosa pine - you can tell by the bark. Some of the other big trees look to have the bark of the redwoods. 1,576.2 Beautiful pink flowers on the embankment. 1,577.8 Lots of big rocks. This is a beautiful drive through the forest. It’s a sunny day with a lovely blue sky, lots of flowers to be seen but virtually nowhere one can stop for pictures. However. there is a vista point coming up just ahead. 1,582.1 Passed the vista point - it was on the other side of the road! 1,582.5 9:26 - 9:43 Donnell Vista Point, GPS El. 6,237 feet. 1,582.6 9:57 (leave) Donnell Vista Point trail. I stopped again before leaving the vista and set off down the trail. There were a number of interpretative signs and it is one of those trails where you keep saying, “just around the next corner, oh just the next corner,” but it was going downhill and I said, “No more corners. I had better get back.” Just saw th bark, which I thought might be redwoods - they are actually cedars. That was a very good stop and well worth while. LP agrees with me that this is a lovely road and maybe nicer than going over Tioga Pass or going into Yosemite. There is certainly not the traffic on this road. There are lots of flowers blooming along the way, just none where you get to pull off, big clumps of color. 1,585.7 Sonora Pass is only 17 miles now and the road is climbing at this point and winding more than it was before. 1,587.8 A view of a fast flowing river below the road on the left. 1,588.4 5,800 foot elevation. Dardanelles - name of the place and I think it’s a campground with a store, possibly. Dardanelle Bridge 1933. The Middle Fork Stanislaus River Bridge, also known as the Dardanelle Bridge, represents the last known timber scissors truss-a bridge type well suited for quick erection in rugged locations without the use of falsework in California. It was determined eligible for inclusion in the National Register of Historic Places at the State level under criterion C in 1987. By the early 1930s, many of California's bridges, that were designed and erected in the late 19th and early 20th centuries, had reached obsolescence. Designs, which had been adequate for light, horse-drawn loads, were inadequate to meet the demands of increasing weights and volumes of motor vehicles. Thus, it was that in 1933 the State decided to replace an early bridge on the road leading from Sonora to the east side of the Sierra Nevada by way of Sonora Pass. The State's first solution to the problem, a solution which must have appeared attractive in the growing fiscal calamity of the Great Depression, was to propose relocating a steel, pin-connected pony truss from Sullivan Creek, two miles east of Sonora, to this site nearly fifty miles further east. The rebuilt structure would have consisted of a 71-foot pony truss main span with a 27-foot steel stringer approach span. Founded on a concrete pier and concrete abutment, the bridge was to have timber deck and roadway width of twenty feet. With the contract let to the firm of M. A. Jenkins and J. W. Hoopes of Sacramento, dismantling of the pony truss began on July 22, 1933. However, work stopped almost immediately when Tuolumne County officials protested, disputing ownership of the bridge. It seemed that the county had similar plans to reuse the bridge at a county road crossing of the South Fork of the Stanislaus River. On August 4, 1933, the State conceded ownership of Sullivan Creek Bridge to Tuolumne County. A day earlier State officials had signed an amended contract for the construction of the Middle Fork Stanislaus River Bridge. Existing historical records do not indicate whether State bridge engineers had responded quickly to the State/County dispute in developing a design specifically tailored to this site, or whether they adapted a previously-used design. Given the extremely short time involved between the awarding of the original and amended contracts, and the fact that there were at one time other bridges of this type in California (though never in large numbers), the latter appears more likely. The design, using a scissors truss main span with simple timber trestle approach spans, was ideally suited to this site where the Middle Fork Stanislaus River crashes through a deep, rocky gorge. The site precluded the use of elaborate falsework. Instead, the contractors threw logs over the channel, on which they erected sufficient falsework to erect the scissors truss main span. Since the scissors truss uses no lower chord, the contractors first erected the top chords, and then placed the battered end posts, fastening the whole with steel gusset plates bolted to the timbers. After positioning these assemblies, they poured the concrete footings for the end posts. Finally, they placed and adjusted the diagonal tension rods which run from gusset plates to the opposite end post footings. The final construction report noted that great care had to be taken when excavating for foundations, since the granite was soft and seamy, leading to a danger of "overshooting" when blasting. Even with all precautions, the rock tended to break to adjacent faults or seams, a problem which would reassert itself in 1991. The contractors built the bridge by hand labor, with only a pneumatic jackhammer used for drilling rock for blasting. Sand and gravel for concrete came from a bar in the river approximately three miles east of the bridge site; the builders screened aggregates by hand. The contractors used Calaveras brand Portland from a plant not far from Sonora, taking the required water directly from the river. Reinforcing and structural steel came from Palm Iron Works of Sacramento, trucked to the site by the contractors. All redwood timber came from the Union Lumber Company mill at Fort Bragg; Union Lumber delivered the materials to the site by truck. The benefits of the elegant simplicity of the design, which allowed for easy erection, can be seen in the fact that on October 19, 1933, little more than two months after award of the amended contract, Jenkins and Hoopes completed construction. The State accepted the bridge from the contractors a week later, on October 26, 1933. Total cost of construction was just $7,289.54, which included asphalt paving applied by State forces after the contractors finished construction. Of the contractors, the State's final construction report stated that "Mr. Jenkins was inclined to quibble about details, but Mr. Hoopes [who acted as construction superintendent] was always agreeable and complied with instructions without question." The Middle Fork Stanislaus River Bridge (Bridge No. 32-13), also known as the Dardanelle Bridge, consists of a redwood timber scissors truss main span with redwood timber trestle approach spans. The approach spans are carried on four-column redwood timber bents with redwood bent caps. The abutments, bents, and truss end posts are all founded on Portland cement concrete pedestals resting directly on exposed granite bedrock. The bridge carries a laminated timber deck which was overlaid with concrete in 1946, this latter now itself overlaid with asphalt. Bridge railings are of timber construction. The bridge's five spans total 97 feet in length. The design was carried out by F. Manhart, an anonymous engineer of the Bridge Department of the California Division of Highways. "Finding of Adverse Effect for a Proposed Bridge Replacement Project, Bridge 32-13, the 'Dardaneile Bridge,' on State Highway 108, Tuolumne County, California." Unpublished MS, California Department of Transportation, Sacramento, October 1988. Gudde, Erwin G. California Place Names. Berkeley: Universityof California Press, 3rd edition, 1969. Jelinek, James C. "Categorical Exemption/Exclusion Determination, lO-Tuo-108, 51.3/53.4, 10200-214800. Public environmental document, California Department of Transportation, Stockton, December 13, 1988. Jelinek, James C. Chief, Environmental Branch, District 10, to Kathryn Gualtieri, State Historic Preservation Officer, LS, June 6, 1990, regarding construction damage to historic Dardanelle Bridge. Jelinek, James C. Chief, Environmental Branch, District 10, to Peter Vacura, Associate Bridge Engineer, LS, July 10, 1990, regarding appropriate falsework and repair procedures for historic Dardanelle Bridge. Amended, Road X-Tuo. 13-0," California Department of Transportation, Sacramento, November 13, 1933. Snyder, John W. "Bridge No. 32-13, Middle Fork Stanislaus River." Unpublished MS, California Department of Transportation, Sacramento, September 8, 1978. In 1978, the California Department of Transportation proposed to replace the Middle Fork Stanislaus River Bridge. Following the bridge's evaluation as potentially eligible for inclusion in the National Register of Historic Places, the project was subsequently dropped until 1987, at which time a formal Determination of Eligibility was made. The proposed project will replace the historic Dardanelle Bridge with a new bridge on new alignment, allowing preservation-in-place of the historic bridge. The project will result in minor realignment of State Highway 108 over a total project length of 1,950 feet. Located within the Stanislaus National Forest, the project site is at an elevation of 6,000 feet in the Sierra Nevada, in an area dominated by heavy granite and basalt outcrops in a mixed conifer forest. The existing bridge is situated in an area which is highly regarded by the public and by the U.S. Forest Service for its visual beauty. A massive outcrop of granite commands the site, which is traversed by a deep, narrow gorge through which the Middle Fork Stanislaus River flows. The historic bridge is sandwiched between a granite outcrop on one side and a steep mountainous slope on the other, both of which constitute effective obstacles to consideration of alternative alignments further away from the existing bridge. The new alignment and bridge will be constructed to current standards, with a 24-foot roadway and 6-foot shoulders. Right-of-way will not be established, as the project will be constructed under a U.S. Forest Service Use Permit. The new bridge will be a 110-foot, single span, cast-in-place reinforced concrete box girder structure, constructed on new alignment approximately ten feet upstream of the existing bridge. The new bridge will have standard, 32-inch-high concrete safety railing, and will be at essentially the same elevation as the existing bridge. Following completion of the new bridge, the historic bridge will be removed from vehicular service, and preserved in place for pedestrian/equestrian/bicycle use by the California Department of Transportation as a scenic overlook. 1. The historic bridge shall be blocked to vehicular access, and an interpretive display describing its historical significance shall be installed. 2. The bridge shall remain in the ownership of the California Department of Transportation (Caltran), which shall maintain it consistent with The Secretary of the Interior's Standards for Rehabilitation and Guidelines for Rehabilitating Historic Buildings. 3. The bridge shall be documented to the standards of the Historic American Engineermg Record (HAER), with copies made available to the State Historic Preservation Officer and appropriate local archives. On Wednesday, May 30, 1990, the bridge sustained damage during construction of the new bridge. Contraaor's forces engaged in blasting granite in preparation for placement of the west abutment of the new bride overshoot-a problem noted in the 1933 construction of the historic bridge--and blew large granite fragments into the historic bridge, severely damaging the west approach spans. The damage to floor stringers, bents, deck, and railings caused closure of the eastbound lanes. The bridge sustained some further damage during the contractor's removal of the remaining granite outcrop by use of a backhoe-mounted hydraulic hammer, when large granite fragments rolled into the previously-damaged portion of the bridge. Fortunately, the trusses sustained no damage beyond a broken tension rod in the upstream truss. 1,588.6 Crossing the new bridge and there’s a canyon below through which the river flows. 1,589.7 To the left was the old bridge, and the river with lots of white water is on the right of the road now. 1,590.2 Turning into Columns of the Giants geological site. 1,590.3 10:12 - 10:26 Geologic Site - Columns of the Giants. 1,590.7 Lots of snow on the higher elevations ahead. We are following through the valley along the course of which I think is the Stanislaus River. Incidently this road is closed in winter. 1,593.8 26 % steep winding narrow road one mile ahead, that was 26 % upgrade not downgrade. That is upgrade for the direction we’re going, it’s got to be downgrade for the people coming in the opposite direction. 1,594.9 10:39 - 10:41 Stopped for pictures. 1,595.4 7,000 feet. “We’ve almost reached the top of Mount Kosciusko.” Mount Kosciusko is the highest mountain in Australia at an elevation of 7,310 feet, and when I am driving at higher elevations in this country, I always think about the fact that we were unable to drive to the top of Mount Kosciusko! This is another one of those roads which amaze me as to how surveyors ever decided on a route over the mountains. Every now and again, through my open window, I can hear rushing water coming down the hill somewhere through rocks. 1,598.8 10:49 - 10:54 Stopped at the 8,000 foot elevation marker. 1,599.4 Snow to the left of us some remaining on the hillside, but that was at car level. 1,600.5 Waterfalls to the right. 1,600.6 9,000 foot elevation - still some trees up here but we’re just about at the tree line. 1,603.3 11:05 - 11:20 Sonora Pass, - 9,624 feet. From here we go down the east side of the Sierra Nevada’s. 1,605.3 10% grade 1 mile. 1,605.5 11:26 Leaving El. 9,000 feet. It’s a very good road, not washed out or eroded at all. 1,606.2 7 % grade of 3 miles. 1,607.2 A lot of Aspens up the hill to my right. 1,608.9 Going through a lot of aspen trees both sides of the road. 1,609.2 5% grade for 1 mile and from that point you can get a glimpse down into the bottom of the valley to the right. 1,610.0 11:40 - 11:46 Stopped at an overlook - white poppies or primrose are blooming by the roadside. 1,610.2 Pedestrians the next 5 miles. 1,610.6 Probably lots of camping grounds! 1,610.8 A lot of horses, I think a riding stable. 1,612.0 7% downgrade for 1 mile. 1,613.0 Rushing stream or river at the side of the road. At that point the road flattens out and there’s a big meadow ahead or to the side of us actually now. 1,614.2 Just passed a lot of army trucks and army tanks. We are now by all the red roofs I could see the top of the hill, and I’m stopping. 1,614.4 11:50 - 11:55 Welcome to the USMC Mountain Warfare Training Center. There’s an historical marker here. 1,617.7 There are cattle grazing on the left and they’re standing near a slough or swampy area. There’s even water at the side of the road in a small ditch. Meadows or sloughs both sides or the road. 1,618.4 12:02 The end of CA-108 at the junction with US-395, which goes north to Carson City and south to Bishop. Good bye to “the no traffic road.” US-395 is winding though a valley with hills with sagebrush on them - more or less treeless. 1,624.1 12:08 - 12:11 Fremont’s Trail Historical Marker. .
1,627.5 El. 7,000 feet - really nice to have these markers at the side of the road. 1,629.3 A large flock of sheep being herded in by dogs. 1,631.7 There is a large lake out to the left and the road is descending from the mountains into a wide flat valley. 1,633.1 12:20 - 12:24 Stopped on the flat valley where there’s lots of irises or flags growing and there are lots of cattle grazing. You can see the snow on the mountains, and a lake to the left and vultures or something circling around over head. Lodges, Bridgeport Lake and the little town to the right of that is Bridgeport. The flowers are wild iris, and are blooming, masses of them. Red winged black bird sitting on a fence post. There are a number of red winged black birds to be seen. 1,649.3 6 % downgrade for 4 miles. 1,650.3 12:42 - 12:50 Mono Lake Vista Point. 1,655.9 Entering Mono Basin National Scenic Area ... and some lupines were flowering at the side of the road ... also some of those white poppies or primrose or what ever they’re called. 1,657.3 12:58 Turning off the highway. 1,657.7 1:00 - 2:07 Mono Lake Park ... we had lunch here under a shady tree, then I walked down the boardwalk to the lake. 1,658.3 2:09 Back on the highway. 1,662.1 2:14 Leaving the highway, US-395, to go into Mono Lake Visitor Center. 1,662.6 2:16 - 2:34 Mono Lake Visitor Center ... a wonderful visitor center with indoor and outdoor exhibits and most interesting exhibits about various rocks, plants, as well as what’s going on at Mono Lake. 1,663.0 2:36 Back at US-395. 1,663.3 Entering Lee Vining, El. 6,781 feet. 1,664.2 Passing the turnoff for CA-120, the route west over Tioga Pass to Yosemite (the highest paved route in California). 1,668.6 Lupines flowering along the roadside just before June lake turnoff. 1,673.2 An area where fire has gone through the forest. 2:50 The sky is clouding over. A little ways back I could see the hillside that had clearing on it which would be the ski slops at Mammoth. 1,679.0 Deadman Summit, - 8,014 feet (2nd summit on US-395 when traveling north). 1,688.5 3:01-3:03 Stopped for a couple of pictures. 1,693.9 Passing an airport on the left where there’s a lot of small planes. The sun is catching a mountain range just to the east of the road and there’s very high points on it, all snow covered and to the left of the high point there’s a ridge, also snow covered, which we’ve been looking at for many miles. The sun is shining on the snow and lighting it up. Owen’s Valley is out to my left. 1,696.5 Another lake, Crowley lake, I think. 1,698.2 Lots of cattle grazing between the road and the lake. 1,707.4 3:27 Sherwin Summit, El. 7,000 feet is the first of five mountain passes crossed by US 395 in the Sierra Nevada. Break check area - mandatory for trucks. 1,708.0 6% grade 8 miles. The speed limit 35 mph. 1,711.9 Coming around a bend, a large expanse of the valley ahead, green as if it’s cultivated or something. 1,712.6 End of the two-way traffic and resuming speed again. No not resuming speed again - truck speed is still 35 mph. 1,718.0 Lots of cows grazing to the right - I’m passing all the green that I could see from up the hill. 1,720.2 Another big heard of cattle to the right, green pastures. 1,726.7 3:49 Entering the outskirts of Bishop. 1,728.8 Entering Bishop, El. 4,140 feet. This is near the junction with US-6 to Nevada. 1,738.9 El. 4,000 feet and there’s a lot of cattle grazing to the left of the valley in green pastures. 1,744.8 4:10 Pulling into Ancient Bristlecone Pine Forest information on the outskirts of Big Pine. 1,744.9 4:12 Back at US-395. 1,746.4 4:25 Booked in at Big Pine Motel, Big Pine - Room 17 ($64.96). 1,746.9 Country Kitchen where I had supper ($11.00) ... LP didn’t want to eat and had stayed back at the motel. 1,747.1 Big Pine Motel - end of the day. 1,747.1 7:11 Leave Big Pine Motel. As we leave the motel and pull out onto CA-395 we have a magnificent vew of the mountains to the west of the highway. They still have quite a bit of snow on them. We’re turning north to go back CA-168 which goes east into Nevada. We’ll stop at the information booth before we set off. 1,747.8 Turning off CA-395 and then immediately turning into the information booth. 1,747.9 7:15 - 7:20 Information booth for Ancient Bristlecone Pine Forest, INYO National Forest at the corner of US-395 and CA-168. 1,748.2 7:23 We’re setting off on the National Forrest Scenic Byway to the Bristlecone forest. 1,751.0 7:27 Stopped at the turnoff for Death Valley Road. From this point Scottie’s Castle is 75 miles but the pavement ends in about 25 miles. Then it would be 50 miles of gravel road going through Saline valley and Eureka valley. Just turned momentarily onto this and I’ll take a picture of the information. Everything is open on this Death Valley Road. 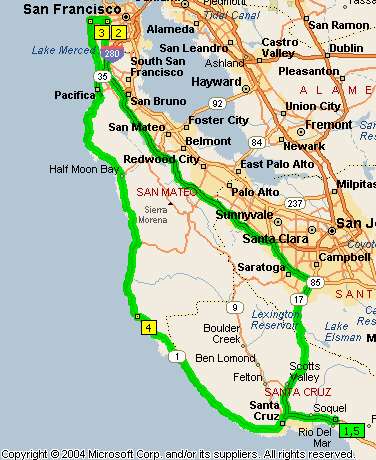 Saline valley 14, Eureka Valley 37 and Scottie’s Castle 73 miles. 1,751.2 7:34 Turning around after a sign on Death Valley Road and going back to CA-168, then onto see the bristlecone trees. 1,751.8 El. 4,000 feet and winding road for the next 16 miles. 1,754.8 El. 5,000 feet ... it’s really interesting how this road is going through a valley that goes into the mountains, a fairly distinct opening through the mountains for the road. The yellow flowers, Prince’s Plume - same as the ones we saw over in Utah in one of the national parks there, all blooming along the side of the highway. 1,755.4 Just pulled over to take a picture each way of the highway to show this opening though the mountain range. 1,756.2 A sign for entering the Inyo National Forest ... quite a lot of wild flowers beside the Prince’s Plumes ... there’s other yellow daisy type flowers, and the white poppies. 1,759.4 Sign for one-lane road. There’s really no room for two cars where the road goes between rocks. 1,687.6 A lot of those white poppies. The road goes in and out of canyons. There are juniper trees, I believe, on the hillsides, some of them looking pretty old and gnarled. 1,762.0 7:57 Turning off for the road up White Mountain to the Ancient Bristlecone Forest. 1,762.5 7:57 There’s a fee area,. We stopped to read the Marmot Alert sign:- “Please be aware of a resent event involving a vehicle parked at the White Mountain trail head. A marmot had chewed through hoses and wiring, consequently the vehicle was towed into town and marmots were discovered hiding under the hood.”. The Visitors Center is 10 miles ahead. I thought that by looking at the needles on some of the trees along here they were younger Bristlecone pines ...the needles were very similar to the Bristlecone pine which I planted in my garden in Lincoln. 1,764.7 8:06 Leaving. Maybe the pine trees I’m seeing are Pinion pine and the Bristlecone are 5 miles ahead from where we came around the corner after leaving the place where I took the pictures. I’ve forgotten about Pinion pines which you see up at the Grand Canyon. 1,766.4 El. 8,000 feet. We are still continuing to climb from the 8,000 foot elevation. There was a distant view of the mountain ranges in the opposite direction from the snow covered mountains on the other side of US-395. We come round bends and we just have these distant, distant views. 1,769.4 Elevation 9,000 feet. From that point you can look to the west and see the whole range, absolutely magnificent. 1,769.7 8:19 - 8:22 Pulled over. 1,770.9 Entering Ancient Bristlecone Pine Forest. Not sure where the forest is because we seem to be above the tree line. 1,772.4 Stopped for a picture because after the long climb up on a narrow road with a steep drop off we are crossing almost a meadow on the top of a mountain. 1,772.6 Turning into Schulman Grove Visitors Center. 1,772.7 8:33 - 9:26 Schulman Grove ... the Visitor Center was destroyed by fire September 4, 2008, and the temporary one was not open - El., 10,105 feet. I went for a short walk up the Discovery Trail, but did not think I should take the time to do the whole circuit, even though it was only a mile - suggested time 1 hour. The trail was uphill, and although I huffed and puffed a bit, this was mostly due to the elevation. I know, however, that I could have done none of this a year ago before working out at the gym! Just an incredible view driving down from the park with about 200 or more degree horizon looking from the east - all the Western Sierras, and we can see the Owens Valley. Looking down to the right we can see all the green fields that drove through yesterday , even the road coming through, I think can be seen and out to the left are mountains of the range that we’re in now just, just and amazing view. 1,775.3 9:39 - 10:04 Sierra Vista - here I walked out to a viewpoint, also uphill. We are just about ready to leave and I’m still huffing and puffing. I did a short hike up at the top (Schulman Grove Visitors Center0 and now this one, neither of which I could have done a year ago, so the work at the fitness center has really changed my life. My left knee is still giving me some trouble. I’m nursing it on these hikes as it’s not too sure of itself but at least I was able to do it which I never have done before, and it’s just so enjoyable to be able to get out and do these things. Now, it’s “Home James” and don’t spare the horses, via Death Valley and whatever other route we decide on. LP has already decided that we’re going to go back towards Big Pine and take the rough road to Scottie’s Castle, rather continuing on, on CA-168 into Nevada, so here we go! As we drop downhill we get lots of beautiful vistas towards the western Sierra range. One of the things which absolutely amazes me is the condition of this road, it’s excellent and for the elevation and obvious winter conditions it just incredibly good. LP and I were talking about the road up and it’s not likes it’s damaged under the sever winter conditions and patched up. It doesn’t have patches all over the place like I’ve seen on some mountain roads. 1,778.3 Lovely pink thistle flowering. Coming down the hill I’ve seen some purple daises, some yellow mallow, pink flowers which I don’t know, so there’s a variety of flowers that was after seeing thistles ... gradually more wild flowers are appearing. 1,782.9 Leaving the entrance gate, but now I’m being followed by those two racing cars , which we saw at the top. 1,783.3 10:24 Back at the highway. It’s 70 miles to the junction with US-95 and 30 to Big Pine. We’re going back west to take that road into Death Valley. 1,783.7 10:25 - 10:27 White poppies. There are some orange mallows blooming on the other side of the road, but I’m not going to worry about the other wild flowers until we get into Death Valley. We need to get on our way now because we really should get into the park before too much time goes by. 1,784.3 Downgrade the next 9 miles. Some of the yellow daisies looked a bit like the moonbeam coreopsis. 1,785.3 The one-lane road is just around the corner. It actually goes down through the rocks, quite a canyon, deep, deep cliffs. 1,786.0 End of the single lane, but still continuing through the canyon. 1,786.4 End of the narrow part of the canyon. 1,787.2 8 % grade for 4 miles and the road is narrower again at that point in the canyon so we’re still not out of it. There are lots of rock avalanches coming down the sides of the mountains that come down to the canyon. 1,788.3 Back to 6,000 feet. 1,788.5 Now the canyon is starting to open out to that gap the road came through coming up form the valley. 1,788.9 Now it is much wider. Some of the yellow flowers are the brittlebush that we get in Arizona except it’s all finished months before this is coming out. 1,791.7 10:33 The road started to wind through the foothills toward Big Pine. 1,793.7 More or less back down in the valley. 1,794.2 10:49 Turned onto Death Valley road and it shows me that the road is going to start winding back into the foothills again. 1,796.2 Started to wind back into the foothills. 1,796.4 Come around a corner we’re surrounded by all sorts of bad land type cliffs that. 1,796.9 We’re just gone over a couple of dips with signs subject to flooding but the actual bottom of the dip has white stuff like white mud or something across it. 1,800.4 This is a really weird landscape. 1,802.2 Eroded cliffs with little caves in it or places where birds could have nests. 1,802.5 And the road is going through cliffs now, right into the rocky area ... another canyon. 1,802.6 11:03 - 11:07 Stopped to look at the strata in the canyon. 1,806.0 Quite a lot of mallow blooming along both sides of the road. 1,808.5 There’s a sign 15 mph through a curving section of the road descending down through the hills. Lots of old junipers on the hillsides, also the mallow blooming. 1,809.8 Down on the flat and it looks as if it is not paved. If this is the start of the gravel road it’s a lot sooner then 25 miles from where we turned onto the highway. 1,810.5 End of the straight flat stretch. 1,811.6 We stopped a vehicle coming towards us - it turned out to be a ranger, and we were able to talk to him. He recommended that we don’t continue because the last half of the road is all rock, high clearance stuff, and we would be very foolish to even attempt it. The ranger told us we couldn’t carry enough spare tires in our Honda! So we’re very disappointed but we are turning around. I’m going to take a few pictures and then we’ll head back from this road and I think we’ll go back to Big Pine, down CA-395 until we turn into that area down there which would be the best thing to do at this stage. 11:29 Leaving from where we turned around. There are Joshua trees on the slope to our right after we turned around. 1,813.4 Back on the paved road. 1,819.7 11:42 Leaving. We are thinking that what I was calling a canyon looks more like a man-made cutting. 1,820.4 It is still very difficult to tell whether it has been cut or is natural. There has been no markers for elevation on this trip, but coming back, you have the impression that we have climbed maybe a couple thousand feet because the valley is still well below us and we have be descending almost continuously. 1,823.0 A cyclist going up the hill in the opposite direction and having a hard time. 1,824.0 11:53 Prince’s Plumes. There is a tremendous variety of geological features. 1,828.9 12:01 Back at CA-168. Just going to have a look at the map before we go out to the highway. 1,829.0 12:03 Turning west onto CA-168 to return to US-395. 1,831.3 12:08 Junction with US-395 and there’s lots of traffic on the road. Entering Big Pine. 1,834.3 Out to the left in the distance I can see the bad land area through which we drove on that other road. 1,842.7 To the right, the hillsides are all covered in scattered black rock - it’s like lava rock, and is on both sides of the road now. 1,845.2 And it’s fairly thick so it’s a large lava field. 1,848.2 Crossing another lava field. These lava fields are fairly extensive. We’re on a very long stretch of road construction with a single lane. 1,855.3 End of the single lane. 1,856.3 Back to single lane again. 1,862.8 Alfalfa being irrigated with sprinkling pipes on wheels. 1,874.2 Entering Lone Pine, elevation 3,700 feet... sign at the side of the road - Little Town With Lots Of Charm. 1,875.0 1:02 Leaving the gas station. 1,877.2 1:06 - 1:36 Eastern Sierra Interagency Center. 1,877.3 1:38 Turning onto CA-136 Panamint Springs 47, Stovepipe 77, Furnace Creek 102. 1,881.2 Passing evidence of mining in the hills on the left. 1,884.9 Still passing evidence of mining. 1,887.5 It’s very sandy to the right of the road, and at that point we are very close to the hills or mountains on the left. The lakes to the right look to be pretty salty or alkaline . There’s a bit of water in it but there is also a lot of white area. 1,892.0 Passing Sulphate Road. That’s where the plant is and the big heap of white stuff, so does that mean they’re harvesting sulphate off the lake? (See Wikipedia note above). The road is going south, south-east at the foot of the mountains on the left. 1,895.2 1:54 CA-136 ends at the junction with CA-190, Panamint Springs 31 miles now. 1,901.4 Lone Joshua tree to the right ... now there are several more showing up ... there are a few Joshua trees scattered across the landscape, but not very many. 1,907.2 Still seeing Joshua trees maybe a few more of them. 1,908.5 18 miles to Panamint Springs. 1,913.7 2:11 Entering Death Valley National Park. Stopped for a picture of the entrance sign. 1,914.1 Steep grade, sharp curve the next 12 miles, I think it said. 1,917.7 There’s creosote shrubs at the side of the road. 1,918.5 2:18 - 2:23 Father Crawley Vista Point. 1,918.6 El. 4,000 feet again. 1,923.1 Elevation 3,000 feet. I don’t remember noticing any scoria last time but there’s really miles of it (if that’s what it is). 1,926.5 2:37 Welcome to Panamint Springs Resort, Motel, Café, RV and gas. 1,927.7 2:39 Start of the long straight stretch of road across the bottom of the valley. The road is still going downhill however. 1,931.2 Sign: Turn off air conditioner for next 10 miles. 1,940.8 Towne Pass, El. 4,956 feet ... downhill for the next 17 miles. 1,944.2 Seeing some more Prince’s Plumes again. 1,946.3 3,000 feet and ahead we have a very broad valley, desert looking, white lakes. I don’t know how you describe it ... probably nothing there. 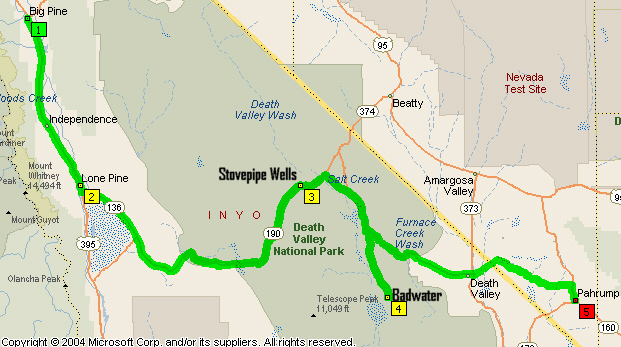 1,957.7 Entering Stovepipe Wells, El. 5 feet. 1,958.1 3:12 - 3:15 Stopped at the ranger station, which was closed - notice “No fee today” It was 100° at the ranger station. Leaving Stovepipe Wells, I can see the sand dunes to my left. 1,965.4 Passing a turnoff for Scottie’s Castle, 38 miles and Beatty, Nevada, 27 miles. 1,968.3 We are still at sea level, although the road has been going up and down so we haven’t remained at sea level. 1,972.1 Passing another turnoff to Beatty. 1,982.7 3:40 Entering Furnace Creek, El. -190 feet, that is 190 feet below sea level. 1,983.1 3:42 - 4:03 Furnace Creek Visitor Center. 1,984.6 4:07 Turning down to Badwater. 2,000.1 Telescope Peak, elevation 11,049 feet ... the colors in the cliffs on the east side of the road are absolutely amazing - so much variety of color in the rocks or the soil and varying shades of the same color and contrasting colors. Down on the land where the road is, it’s what I think they would call a gibber plain in Australia - a field of rocks very little else. 2,013.5 Passing by a lot of black lava type rock and it’s flat out to the left and this is quite black compared with all the color in the cliffs behind. 2,018.4 4:58 Back at sea level, Junction with CA-190, and the junction with CA-127 is 29 miles. 2,029.6 Up to 2,000 feet. 2,031.3 Passing sign which says thanks for experiencing your National Park and the other way of course says Death Valley National Park. 2,035.2 5:15 The Death Valley National Park boundary. Leaving the park. 2,037.6 3,000 feet. Junction with CA-127, Lathrop Wells 27 miles to the north, Shoshone 28 miles to the south. 2,048.1 5:27 Turning onto CA-127. 2,053.7 Amargosa Basin, Nevada - It had an elevation and I missed it, too small a sign, GPS says 2,047 feet. 2,066.1 I just caught a glimpse of a town down in the valley to the left. 2,067.8 5:49 Welcome to Pahrump. 2,069.7 Passing a house which has dessert willows and mimosas in flower. 2,074.7 5:58 Junction with NV-160 and I’m turning onto it here - 3 miles into Pahrump, and 67 miles, I think to Las Vegas. 2,077.0 6:01 Pahrump elevation 2,695 feet. 2,079.5 6:05 Arrive Best Western Pahrump Station. 2,079.7 6:24 Checked in and parked outside room 117 (suite - $107.90) ... we sat on the patio and had our supper there ($43.00) - very pleasant. 2,079.7 8:08 Leaving Best Western Pahrump Station - 76°, and driving home today. 2,090.2 Since leaving Pahrump, there are Joshua trees scattered across the valley between the mountain ranges ... a mountain range to the left, one to the right, one ahead and probably one behind too! Nevada has more than 300 named mountain ranges, all running north-south as part of the Great Basin complex. Elevations range from 2,000 to 3,000 feet. The state has the most number of peaks above 10,000 feet. The highest peaks are in the "cold desert" climates of the White Mountains, near Mount Whitney, the highest point in the Lower 48 states, with Boundary Peak (13,145 feet); and Wheeler Peak (13,063 feet) in Great Basin National Park, near the Utah border to the northeast. 2,097.4 Lots of Joshua trees - they’re not huge, some are a little bigger, some are quite small but there’s a lot more in this area than there were back further. 2,109.0 Entering Spring Mountains National Recreational Area - still seeing Joshua trees. 2,112.6 Mountain Springs summit - 5,490 feet ... 7% downgrade for 3 miles. 2,113.5 Leaving Mountain Springs National Recreational Area. The road is winding through rugged rocky mountains. 2,115.2 Sign for Red Rock Canyon National Recreation Area. 2,115.6 Still descending, but around a corner, there are about 3 mountain ranges, and tucked between them the high-rise buildings of Las Vegas can be seen in the haze. 2,117.0 Fabulous rocky mountain sides with red rock showing through off to the left. 2,117.9 Entrance gate into an area - whether that’s where Red Rock Canyon is I don’t know. I know that Red Rock Canyon is on my list of places to visit in Las Vegas. The morning sun is shining on the rocks and it’s absolutely gorgeous. 2,127.3 8:51 Stopped for a red light on the out skirts of Las Vegas - less than 20 miles to the city. 2,136.1 9:09 Turning onto I-215 east. 2,143.5 Freeway ends and I’ll be turning onto US-95 at Exit-1. 2,144.5 This is US-95 south, US-93 south and I-515. 2,150.5 9:22 The freeway has ended ,that is I-515. It’s 2 miles to the turnoff to US-95. US-93 goes across the Hover dam and we’re not taking that route today. 2,151.3 Boulder City, El. 2,507 feet. 2,152.5 9:24 Turning south on US-95 for Searchlight, Laughlin and Needles. 2,153.2 Searchlight is 36 miles, Cal-Nev-Ari 48, Needles 88. The town's name is a syllabic abbreviation of California, Nevada, and Arizona. Cal-Nev-Ari was created in the mid 1960s by Nancy & Slim Kidwell, who acquired a 640 acre section of land from the U. S. Government and commenced development of an airport-based community. In addition to the FAA designated Kidwell Airport, the community has grown over the years to include a casino, motel, RV and mobile home parks, convenience market, and over 100 residential lots. A consequence of the September 11th terrorist attacks is that trucks and motorhomes are no longer allowed to pass over Hoover Dam. 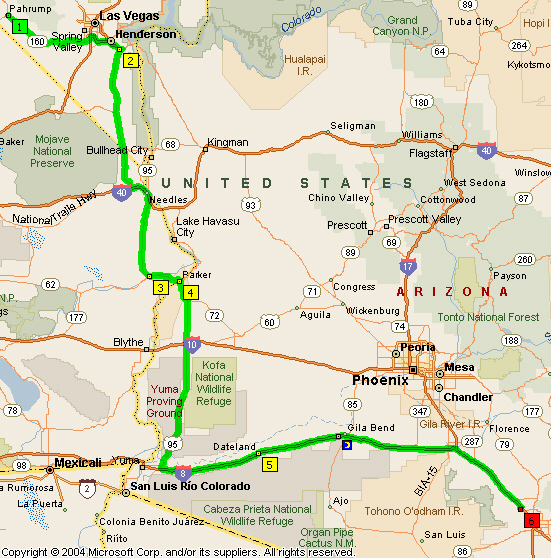 As a result, they have now been routed down U.S. Route 95 and through Cal-Nev-Ari in order to get to Arizona. 2,164.8 Looks like some kind of solar array although they all look to be pretty flat rather than pointing at different angles. LP is thinking it might be a desalinization thing but certainly it doesn’t look like water, so just not sure what we’re looking down on. The sun is striking it and it’s not shiny. 2,174.2 Joshua Trees and also some yuccas and I think there were some back earlier. 2,187.2 We’re crossing over one of the mountain ranges and there were Joshua trees coming all the way up to summit and still are here. 2,187.7 Summit, El. (GPS) 3,681 feet and then we are going down. I guess it’s an insignificant summit because it has no name and no elevation. 2,188.8 Entering Searchlight, El. 3,540 feet and we will stop to get gas. We stopped at one gas station, but the card reader didn’t work properly and I got mad. We finished up getting gas across the road. Anyhow it was 2¢ a gallon less. 2,201.4 Passing Cal-Nev-Ari Casino, so this little settlement here with the tri-state name. 2,209.1 10:40 Passing the turnoff for Laughlin, Needles is 33 miles. 2,210.4 The Nevada State Line ... Welcome to California, and right on the state line there is a cattle grid and a sign for the turnoff for the Historic Route 66. 2,227.4 Passing a turn off to the right for Historic Route 66. 2,233.8 A turn off for I-40 to Barstow and then we cross over the interstate. 2,234.1 Turning on to the ramp to join I-40 to Needles and beyond. 2,234.4 11:06 Junction with I-40. 2,238.9 Coming down the hill into the valley, obviously very green from irrigation used for cultivation. There’s a mountain range on the other side of this green area. I can also see some water, and I’m not sure what it is, whether it’s a lake, part of the river or storage. Again I don’t know where we are yet. 2,240.0 Entering Needles City Limit, El. 482 feet. So it’s Needles we’re coming into and Historic Route 66 is the next right. The section of Old Route 66 between here and Kingman, AZ is one t Kingman one of the routes that I want to do sometimes. 2,242.4 Passing what I think now is the exit for route 66. 2,245.0 10:15 Leaving I-40 for US-95 south. 2,245.4 On US-95 south ... Vidal is 54 miles and I think that’s where we pick up the road across to Parker. After leaving Needles the countryside is fairly desolate looking, the road is winding and twisting with a lot of deep dips in some of the areas. We’re surrounded by mountain ranges. I guess there are some creosote bushes ... as far as any of the others, I don’t know what they are. 2,253.1 The road has climbed into some hills twisting and turning ... the road is still climbing into the mountain range. 2,258.3 Ocotillo to the left of the highway. Seeing ocotillo, which actually have some flowers on them, also some cholla. 2,260.4 1,873 feet - could possibly be the crest and now the road is going up and down with dips across it all the way ... again no summit name and no elevation given. Different ranges all over the place, and as the road curves around to the left we have rugged rocky crest to a right. 2,262.2 Adjacent the rugged rocks that are making a very rugged silhouette against the sky. 2,262.9 We’ve curved around again and have this rugged silhouette immediately to our right and they are very rugged rocks. There are some more to the left but the ones I’ve been talking about are on the right .. rocks have fallen down the slope. 2,264.4 Another straight stretch on the road and continuous dips, quite deep ones such that a car almost disappears down into a dip ahead of you. 2,274.0 Passing an area where there were some trees. Actually we just crossed over a wash and on either side of the wash there seems to be trees that go back towards the mountains on the right or down to the left. After the wash we are back into the scrubby creosote, or whatever. I could see the line of trees as we approached, and thought it might have been a river, but it was a wash and no bridge for the road. 2,276.4 Crossing another wash also with trees along it. This highway continues to have dips all along the way and a number of washes as we travel between mountain ranges. Approaching CA-62, which is where we will turn east to go to Parker, now 17 miles. This is in Vidal Junction where there’s a California Agriculture Inspection Station. 2,294.0 12:01 Turning on th CA-62, Parker 17 miles, Phoenix 179 miles. We’ll go into Parker, will have lunch there, then head south on AZ-95 which will end at the junction with US-95 in Quartzite where we cross I-10. 2,299.4 To the left there’s, I won’t say black, but very dark hills silhouetted against lighter and higher ones, quite rugged. I don’t know what the difference is but must be some difference in the geology or the type of rock. 2,304.7 683 feet on the crest of the road with dips back to the west and dips forward. At the high point you can get a view ahead to the valley which is green and more thickly populated, the area through which the Colorado River flows. It was just a nice view at that point. 2,310.9 12:17 Parker Dam is 17 miles ahead at Lake Havasu and we’re turning to go over the bridge over the river. 2,311.2 Crossing the Colorado River end of CA-62 and then I guess we are on AZ-95. 2,311.3 End of bridge and now we’re in Arizona..
2,311.5 Parker, El. 417 feet, founded 1908. We’re going stop here, if possible, and have some lunch before we continue on. Temperature is 104° here in Parker. We drove around a bit in Parker looking for the casino where we’d had lunch with Otis and Florence from Lincoln. It had changed its location! 2,314.9 12:28 - 1:50 Bluewater Casino for buffet lunch ($19.00 incl. Beer and tip). 2,318.7 1:59 Quartzsite is 33 miles, Yuma 118 miles. 2,343.5 Quartzsite Town Limits. This, however, is still outside the town. I just saw some ocotillo and a few saguaros. 2,347.2 I can finally see some buildings in the distance. 2,350.9 2:30 Just entering Quartzsite, El. 879 feet, founded in 1879. No Name Street is the name of one of the streets that we just drove past! 100°. Yuma is now 81 miles. 2,360.2 Quite a number of saguaros can be seen but most of them are single trunks with not many arms; there are some with arms but not very many. 2,362.2 The rugged Kofa range is to the left. 2,362.3 Passing the turnoff for the Kofa National Wildlife Refuge. That’s one of the places I read about in my Arizona Highways and the pictures to go with that. It’s unbelievable that there is such a place in this arid countryside like that. 2,377.7 All sorts of wired and wonderful shapes of the rocks and the mountains to the left closer to the road at this point not right up against it but closer than the range was when I was talking about it earlier. 2,381.2 The turnoff for King Valley, also in the Kofa National Wildlife Refuge. 2,383.2 A crest, 1,467 feet. 2,384.4 Passing a Border Patrol station for the north bound traffic. 2,403.4 The turnoff for Castle Dome, Kofa National Wildlife Refuge. 2,416.7 Leaving the Yuma proving ground. 1300 square miles in size. Controls 2000 miles of restricted airspace. Incorporates the longest overland artillery range in the nation. Boasts the DoD’s most highly instrumented helicopter test range. Maintains 1000 miles of paved and unpaved roads. Contains 600 miles of fiber-optic cable to provide instantaneous test data feedback. Fires tens of thousand artillery, mortar and missile rounds each year. Yuma Proving Ground is responsible for managing testing at three locations: Yuma Test Center at Yuma Proving Ground,the Cold Regions Test Center , Alaska, and the Tropic Regions Test Center , which is headquartered at Yuma Proving round and operates in Hawaii, Panama, Honduras, and other tropic areas. The proving ground is proud of the role it plays in ensuring the excellence of equipment and munitions issued to America’s fighting forces. This work saves American lives and is a solemn trust the entire workforce takes seriously and holds dear. The road is going into a range of mountains or skirting between one range and another, going through them not skirting Also starting to see some crops maybe of hay, alfalfa. 2,418.7 Field of something with trenches in between the rows and water in them. 2,419.0 An irrigation canal to the right and then a grove of probably orange trees and on the opposite side a grain crop that’s gold and ready for harvesting. 2,419.8 Crossing the Gila river and there is some water in it. 2,420.8 Crossing a large canal. 2,425.1 3:41 Leaving US-95 for a road that will takes us onto I-8 east. 2,425.4 Passing through sand dunes. 2,427.1 A red light just before crossing over I-8. 2,427.6 3:45 Junction with I-8. 2,430.3 3:48 Tucson 226 miles. 2,434.0 The east bound lane going underneath the west bound lane. 2,435.0 A broad valley with lots of green crops. 2,435.5 Passing under the westbound lanes. 2,445.9 Passing Exit-30 for Welton ... west of here is the avenue of gum trees and the long skinny golf course along the south side of the road before the exit for Welton. 2,450.9 Thousands of cattle at what looks to be a feed lot. There are big hay stacks scattered all over the area also green fields of new hay being grown. 2,455.3 There looks to be an orchard on the other side of the train line to my left. 2,471.9 Leaving the highway for a rest area. 2,472.1 4:22 - 4:30 Mohawk Rest Area. 2,472.4 Back on the interstate. I’m leaving the highway at Exit-67 for Dateland. I’m going to stop for gas rather then leaving it to the last minute. 2,484.4 4:59 Back on the interstate and there’s a lot of cows, It’s a dairy farm. I can tell by all the milking pumps under the shed. 2,490.2 Big dairy farm on the right hand side of the road and hay stacks galore. 2,495.0 5:13 Just ask what country we were citizen of and then have a good day. 2,521.0 I‘m passing cultivated fields on both sides, cultivated for the growing of hay and just a little further along there’s another huge dairy farm on the south side. 2,529.1 We’ve come to the end of those green fields. 2,533.3 Passing where AZ-85, which comes up from the Mexican border past Organ Pipe Cactus National Monument. 2,537.5 5:45 Passing Exit-119 ... we left I-8 12 days ago when we were on our way to California. 2,552.4 Can see some of the red fruit on the saguaro cacti. 2,580.6 More green fields, near Casa Grande where there’s also a lot of agriculture. 2,590.0 Crossing the dry Santa Cruz river. 2,597.2 6:32 Junction with I-10. 2,646.2 7:12 Left highway at Exit-246 Cortaro Road. 2,647.1 7:14 - 7:23 FRY’s to get milk.